The north temperate zone extends from the Tropic of Cancer (approximately 23.5° north latitude) to the Arctic Circle (approximately 66.5° north latitude). The south temperate zone extends from the Tropic of Capricorn (approximately 23.5° south latitude) to the Antarctic Circle (at approximately 66.5° south latitude). In some climate classifications, the temperate zone is often broken down into several smaller zones based on latitude. These include Humid subtropical climate, Mediterranean climate, and oceanic. Subtropical climates, located between 23.5 and 35.0 north or south latitude on the eastern or leeward sides of landmasses is the southernmost zone. This climate has long hot summers and short mild winters, with annual rainfall concentrated in the warmest part of the year. These climates occur in southern Asia, the southeastern United States, parts of eastern Australia, and in eastern coastal South America. 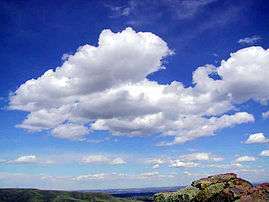 Mediterranean climate, occur between 30 and 42 north or south latitude on the western sides of landmasses. This climate has long hot summers and short mild winters, however seasonal rainfall is the opposite of that of the subtropical humid type, with a winter or cool season rainfall peak common. These climates occur near the rimlands of the Mediterranean Sea, in western Australia, in California, and in the southern most areas of South Africa. The maritime climate occur in the higher middle latitudes between 45 and 60 north and south latitude. They are created by the onshore flow from the cool high latitude oceans to their west. This causes the climate to cool summers and cool, but not cold, winters (for their latitude). Annual rainfall is spread throughout the entire year. Regions with this climate include Western Europe, northwestern North America, and parts of New Zealand. They can also exist in the Eastern United States such as the east end of Long Island, New York and New England such as Block Island, Rhode Island and Chatham, Massachusetts and the high elevations along the Appalachian Mountains including Boone, North Carolina. ↑ Education Scotland. 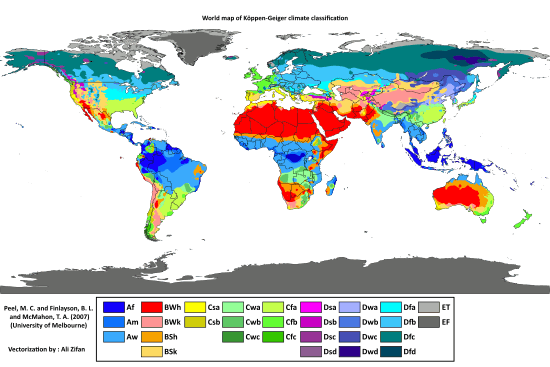 "Weather & climate Change Climates around the world". educationscotland.gov.uk. ↑ McColl, R. W. (2005). Encyclopedia of World Geography, Volume 1. (Facts on File Library of World Geography). New York: Facts on File. p. 919. ISBN 0-816-05786-9. ↑ "Solar Illumination: Seasonal and Diurnal Patterns". Encyclopedia.com. Retrieved October 4, 2012. ↑ Cohen, Joel E.; Christopher Small (November 24, 1998). "Hypsographic demography: The distribution of human population by altitude". Proceedings of the National Academy of Sciences of the United States of America, Vol. 95. Washington, D.C.: The Academy. pp. 14009–14014. Retrieved September 19, 2012. ↑ Germishuizen, G.; Meyer, N. L. (2003). "Plants of southern Africa: An annotated checklist". Strelitzia. 14: 1–1231. Retrieved 23 June 2015.